Allow all types of expense accounts and travel requests to be managed (business travel, purchases, etc…). 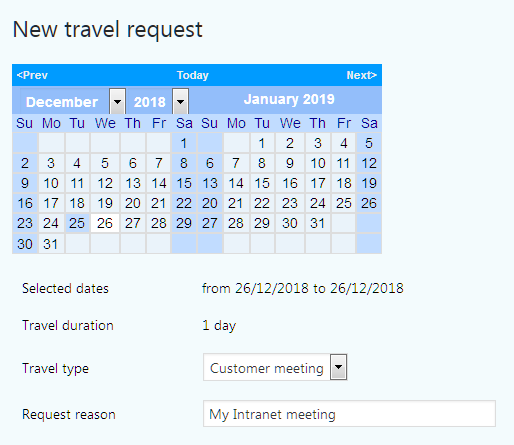 Enable the employee to submit a mission order request before travelling and then an expense account based on the mission order once the travel is completed. Give request history access to the employee and enable them to reuse it as a basis for a new request. Allow manager to validate mission orders and expense accounts. Give the possibility to manage travel and hotel reservation in a centralized way, after mission order validation by the manager. Permit the accounting department to validate and notify of expense account payment via the system. Send an e-mail to the employee and the manager as soon as new event occurs (submission and processing). Time saved when submitting requests : no more paper forms to fill out, no need to send requests to the manager and then reminders (immediate notification upon request approval), possibility to reuse past requests. Risk of error is eliminated : the system calculates the total cost in relation to the amounts input for each expense. Time saved during approval process : one click approval, notification as soon as a new request is submitted. Decision support : visibility of absence schedule (leave and travel). Time saved in processing : no more paper forms to check and file. Time saved informing employees : fewer employee requests as they have direct real-time access to the processing of their requests. Trial the expense account management module now! a page where the accountant processes or rejects the travel and expense requests previously validated by the manager. At this stage, expense claim can be triggered. With the dematerialization of the expense management process, you will save time in the administrative management of travel expenses. Also, if you select the SaaS mode, you don’t have to worry about the maintenance of this online solution. Prior to undertaking an expense (e.g. for business travel), the employee can submit a travel request to their manager for validation. This request recaps the various expenses foreseen. Future expenses can thus be controlled in advance. Further to an expense, the employee can submit an expense account request which must also be validated by their manager. The expense account request uses the same model as the travel request. The only difference being that it corresponds to the real expenses generated which require a reimbursement. Once validated by the manager, the expense request is transferred to the expense management module administrator (the accountant or any other person assigned for this task) so the payment can be made. In order to speed up the creation of a new request, the employee can take a past request as a model and load it as a new request. This is very convenient when submitting requests which are similar and recurrent. To submit a new request, the employee begins by selecting the dates, the type of travel, and the purpose of the expense incurred. transport, accommodation, meals and other (for items which are not covered in the other three families). For a transport expense, the employee gives the means of transport, the date, departure and arrival time, and the cost. In the case of travelling by car they must give the number of kilometers and the cost per kilometer. 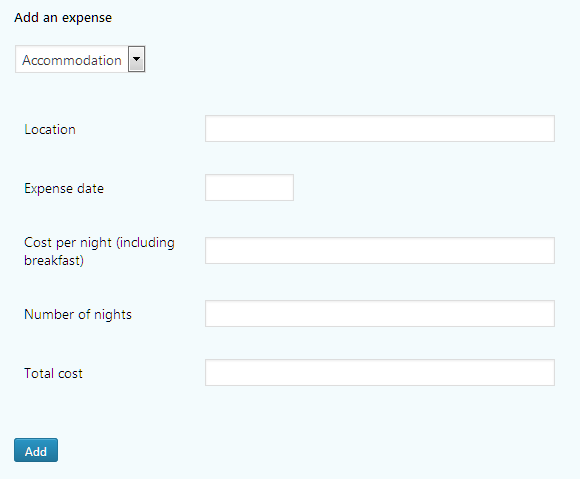 Mileage expenses can be configured. For accommodation and meal expenses, the employee just has to indicate the place, the number of times, the unit cost and the total cost. Finally for the “other” expense type, the employee must give the purpose of the expense, the unit cost, the quantity and total cost. To simplify the task of the employee submitting the request, as soon as they input a unit cost and a quantity, the total expense cost is automatically calculated. 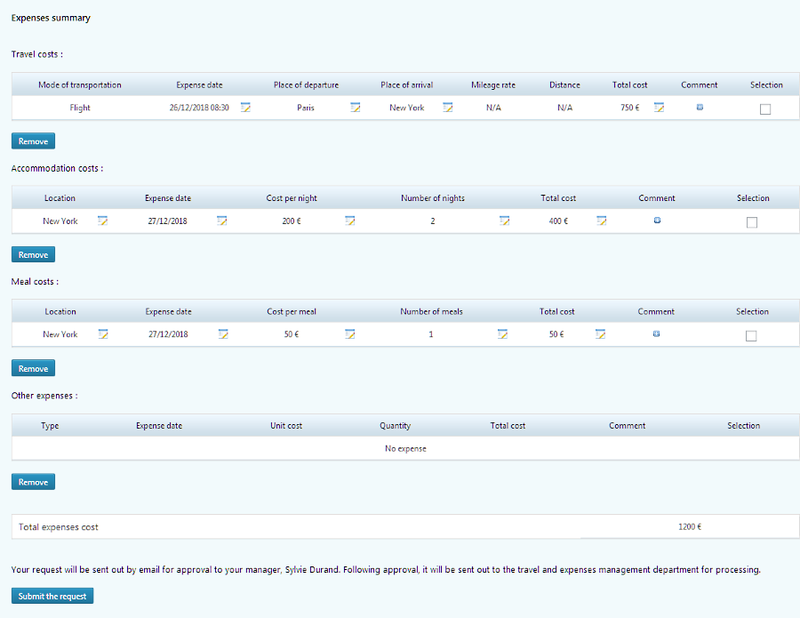 Each expense input is added to the expense recap table which lists all the expenses input for the same request. The employee can edit and delete the different expenses they input. They can also view the total cost of their request which is automatically updated in the case of additions and modifications. Once completed, the employee can submit their expenses to their manager for validation. The user has a record of all the requests made on the same page. This record contains the expense details as well as status of each request. The user can also print, if necessary, the request in a suitable size to forward it in paper format. In addition, the user can delete requests. As soon as a new request is submitted for validation, the manager receives notification by email inviting them to log on to the system to validate the request which appears in the list of pending requests. The manager can thus approve or reject, giving reasons for their decision. Once the request is approved, it is transmitted to the accountant in charge, who also has the possibility to approve or reject the request. On the validation page the requests submitted record and the leave schedule can also be viewed. This is a valuable decision-making aid.